We are a family run business providing a professional and friendly window cleaning service in Stansted, Essex. 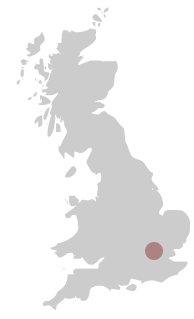 We have a reputation for reliability and care since we established our cleaning business in 1994. 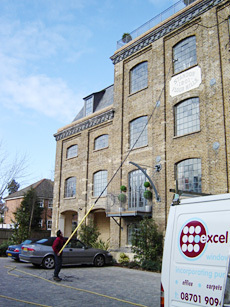 Office, shops and high rise specialist window cleaners. Water fed pole system and traditional hand window cleaning. 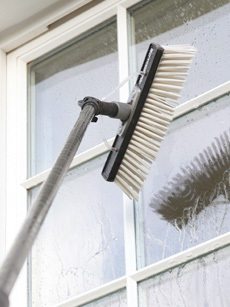 We cover all aspects of window cleaning from homes and small shop fronts to high rise buildings. Combining conventional methods with a pure water system enables us to provide the best solution to various window cleaning situations. Our fully trained and certified window cleaners provide a reliable service in and around Stansted. If you would like to comply with Health & Safety legislation, we can provide advice and highest level of window cleaning to your requirements using the latest technology available. If you need reliable residential, business or office window cleaning in or around Stansted please contact us and one of our window cleaning team will be pleased to provide a free quotation. We also specialise in difficult to reach windows and our experienced window cleaners are careful and effective in high rise situations.